Since the World Cup, things have gotten worse. The pieces are not falling into place. Brazil put together a run of six wins without conceding a goal, but the level of performance was not satisfactory. Tite is struggling to get the pieces to fit once more; the evidence that he has yet to succeed was clear in Saturday’s 1-1 draw with Panama. Brazil went into this game, staged in Porto, Portugal, with a reserve defence. But further forward, in the absence of the injured Neymar — plus Vinicius Junior, who had been called up for the first time — the coach went with a lineup that he has been very keen to see in action: Casemiro holding the fort, Arthur shuttling in midfield, Coutinho pulling the strings, Richarlison cutting in from wide on the right, recent AC Milan signing Lucas Paqueta on the other flank, and Roberto Firmino at centre-forward. 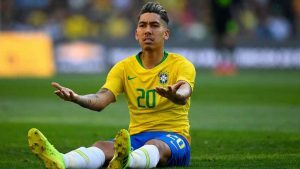 With restricted training time and players with different characteristics, Tite has yet to find a way to get the best out of Firmino. He is not linking up with Coutinho and forming part of a circuitry of passing on the edge of the penalty area. And he is a centre-forward with an obvious lack of physical presence in the penalty area — hence the choice of Richarlison, a mixture of wide striker and penalty area operator.